London in the 1870s was a period of great expansion for the suburban railway. Most of the LB&SCR suburban services were first worked by ancient Craven tender engines which were highly unsuitable and caused severe congestion at the London termini as they queued to be turned. Their replacements, Stroudley’s A class tanks, had proved to be successful on inner suburban services on both the South London and East London Railways, but they only had the capacity to carry half a ton of coal and 500 gallons water, and were therefore of limited use on outer suburban duties. Stroudley’s D class 0-4-2 tanks with 5′ 6″ driving wheels, introduced in 1873, were perfect for the task; they were more powerful than their 0-6-0T cousins, had greater coal and water capacities, were shown to be very economical in use and were very free running. Their success resulted the building of 125 examples down the years to 1887, thirty one of which in the 1890s were based at New Cross for servicing trains north across the river via the ELR and SLR lines. As suburban traffic continued to increase in capacity and weight, so the D1s began to take over even the inner suburban turns traditionally associated with the Terriers, which by the mid 1890s were rapidly being stripped of their condensing equipment and rusticated. The introduction of Billinton’s radial and bogie tanks in the 1890s had no more than a little effect on the class in the London district, but further introductions in the early 1900s prompted their rapid decline on outer suburban services and heralded the first withdrawals. The D1s remained in use on services over the East London Railway until electrification in 1913, and on the East London Railway Extension until 1915. The D1 0-4-2Ts are one of my favourite designs, and a couple of examples from Albion Models kits will share turns with a Terrier on LB&SCR services through Basilica Fields via the East London Railway Extension and Extended Widened Lines. Number 299 New Cross, of that shed, is a likely candidate and is seen here on a south London suburban service c1900. Due to the frequency of trains over the ELR and ELRE, it would make sense to incorporate at least another one of the 31 members of the class allocated to New Cross during the mid 1890s, and I’d really like to build number 281 Aldgate, but unfortunately it appears the loco was wedded to Battersea for the duration, and is therefore very unlikely to have serviced the ELR/ELRE. There were no other D1s at New Cross with suitable local names, so I’m currently undecided as to the identity of the second loco, though Ditchling is a possibility, and would be a bit of a doff of the cap in the direction of Gordon & Maggie Gravett who produce some fabulous models. The reason for my interest in No.281? It was a painting of a Metropolitan 4-4-0T and Great Western Metro tank at Aldgate station which was the catalyst for the entire Basilica Fields project. By 1870 the LB&SCR was operating an increasingly intensive suburban service over lightly laid lines with shoddy sleepers, shallow gravel ballast and formidable gradients, and worked by unsuitable (and often ancient) tender locomotives built by Craven. On his appointment to office, William Stroudley immediately set about reorganising Brighton Works and began to tackle the even more urgent need for new locomotives in the express passenger and goods links. Although his first drawings for a suburban tank appeared in the middle of 1870, it wasn’t until two major revisions had occurred that the first half dozen were released to traffic in 1872. The class proved to be a phenomenal success; fifty examples were built down to 1880, and all bar half a dozen of these were shedded in the London area at New Cross or Battersea for working predominantly the East London and South London lines. Eschewing injectors, Stroudley introduced his feedwater heating system with the Terriers (which was perpetuated with his D and E class tanks), whereby the water in the tanks was pre-heated by exhaust steam from the blast pipe operated by a crank via a rod from the cab. This crank cut off most of the exhaust steam from being directed up the chimney, instead sending it back into the left hand tank via a copper condensing pipe where the steam circulated, heating the water before penetrating the right hand tank. Any remaining uncondensed steam then travelled back to the smokebox via the right hand condensing pipe. Until the Great Eastern, South Eastern, Metropolitan and Metropolitan & District railways commenced services over the ELR in the mid-1880s, New Cross was home to twenty three members of the class, but by this time suburban trains were becoming heavier, and Stroudley’s 0-4-2T D class began to oust the Terriers from many of their traditional services. In consequence, a number of London based Terriers were rusticated, so that by 1887 only fourteen remained at New Cross, some of which participated in the LB&SCR’s 36 trains each way over ELR every weekday. The opening of the New Thames Tunnel on the East London Railway Extension and the Extended Widened Lines did nothing to halt their slide from inner suburban workings, and from 1892, as the class began to enter Works for replacement cylinders, Billinton called time on almost all the Terrier’s activities over the ELR and ELRE by removing their feedwater pumps and condensing equipment. 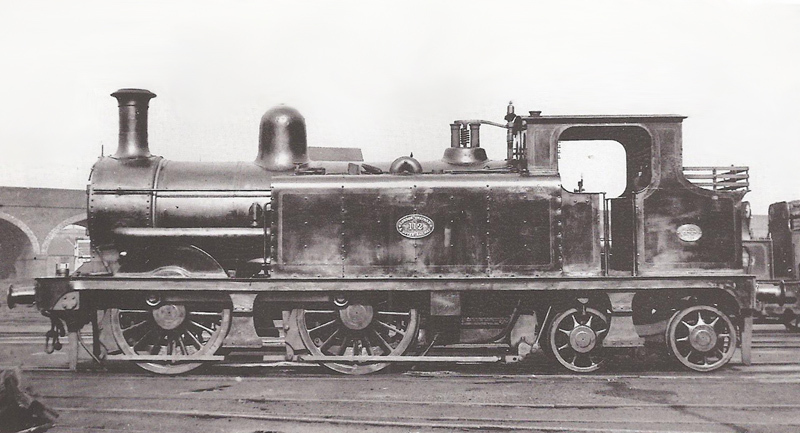 By 1895 only two examples of condenser fitted Terriers remained at New Cross – No.52 Surrey and No.59 Cheam, but the former was in such poor mechanical condition that it was relegated to shed pilot duties only. Surprisingly Cheam continued to work on ELR and ELRE duties alongside the more powerful D1 tanks, and was involved in an accident at New Cross on a mid-afternoon service from Shoreditch in 1897, whereby it lost its bunker and a side tank in a collision with a Gladstone 0-4-2 Samuel Laing, which suffered even greater damage. Even more surprising is the fact that the loco was repaired and resumed its duties with it’s condensing equipment intact. However, by the mid-1900s, the class that had been so for so long linked with the East London Railway and the Extension, no longer ran trains on those lines. Sale or scrapping awaited several members in the early years of the 1900s, until Billinton’s successor, D.E. Marsh, gave many a new lease of life on push-pull services in his new and handsome livery of umber. There are currently only two kit options in 7mm for Terriers (leaving aside the scratchbuilt route, complicated somewhat by the Stroudley roof), viz; a whitemetal offering from Roxey, and a brass effort from Ace, neither of which fills me with great confidence that a satisfactory model can be built without recourse to a bin some changes. I suspect the Ace kit will be the way I choose to go (n.b. order those calming pills now), if only because whitemetal loco bodies in 7mm are a bit of an anathema. As to which loco it’ll be – I’m not too sure. Cheam (see previous post) is an ideal candidate, not only as she spent most of her life, except for a few years in the mid-1880s, at New Cross, but also due to the longevity of her condensing gear and ELR/ELRE duties. However, I wouldn’t mind one with a local name more appropriate to Basilica Fields such as Bishopsgate, Whitechapel, or Shoreditch, all of which were unfortunately denuded of their condensing gear in the early 1890s. 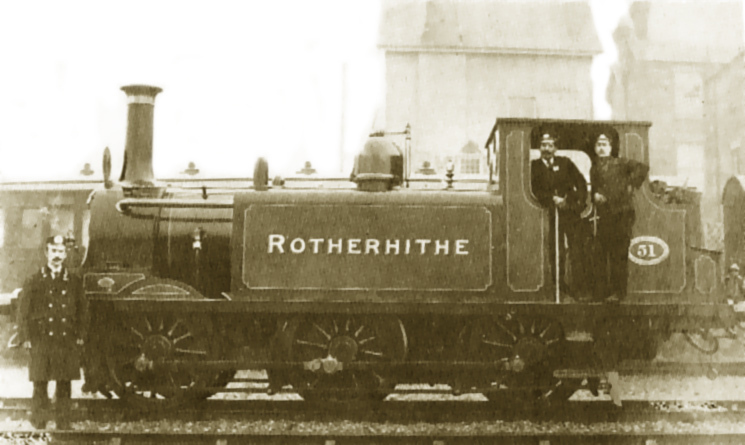 No.51 Rotherhithe, a New Cross engine from release to traffic in 1876 until the mid-1890s, is another candidate; she retained her condensers until withdrawal, but was transferred to Brighton in the mid-90s. In 1898 she was added to the surplus list, but didn’t receive the ‘6’ prefix that many of hers sisters were given, and was withdrawn in February 1901. 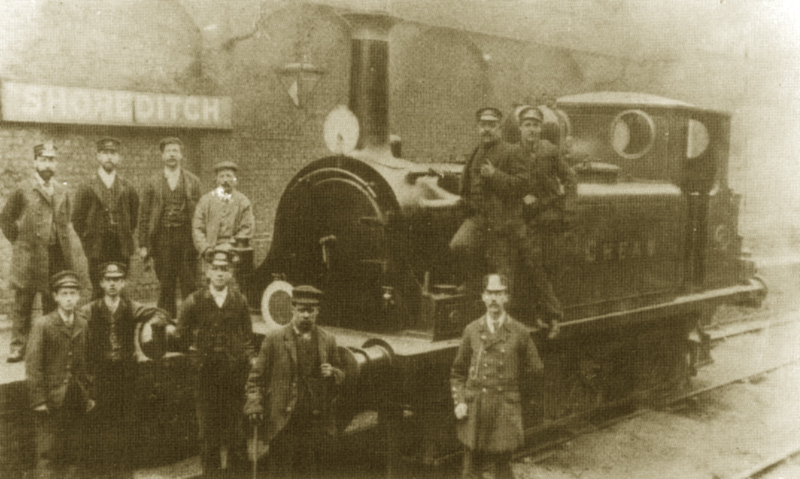 The London, Brighton & South Coast Railway was the first company to operate over the East London Railway, services commencing 7th December 1869 between Wapping and New Cross. The company had sprung from the merger of the London & Croydon and the London and Brighton Railway companies in 1846, which had opened their lines in 1839 and 1841 respectively. The London & Croydon shared the route at the London end with the London & Greenwich, which itself became part of the SER in 1845 – both companies providing their own stations at New Cross, and both of which later became the terminating stations for many ELR trains. With the opening of the South London Line from 1866, Old Kent Road and later Peckham Rye would also become terminating stations for some LB&SCR hauled ELR trains. Extending the line northwards under London Docks proved to be an herculean task, but LB&SCR trains eventually ran into Liverpool Street from 1876. With the formation of the East London Railway Joint Committee (ELRJC) in 1882, which comprised the Metropolitan, Metropolitan & District, South Eastern Railway, London Chatham and Dover, the Great Eastern (from 1885) and the LB&SCR, the latter took responsibility for maintenance until handing over to the SER in 1885 (which had itself withdrawn trains over the line the previous year). From 1886, with the advent of GER services over the ELR, LB&SCR trains were cut back from Liverpool Street to Shoreditch, and the GER then took over LB&SCR services to Croydon. With the opening of the ELR Extension (ELRE) and the New Tunnel, the LB&SCR provided passenger services over the Extended Widened Lines (EWL) through Basilica Fields to Bishopsgate (Liverpool Street), and for the first time provided a limited goods service to its recently opened small depots on the EWL. By 1902, the LB&SCR was providing 64 of the 276 passenger trains every weekday over the ELR, but because the ELRJC initially failed to back the electrification plans for the Circle extending over the ELR, the Metropolitan and Metropolitan & District withdrew services over the line from the end of 1906, the upshot of which was that within five years the LB&SCR was providing over 100 trains daily to Shoreditch and back. The ELR was finally electrified in 1913. By the early 1900s, passenger receipts over the EWL/ELRE were falling fast due to competition from the roads. Electric trams along Mile End Road, Burdett Road and Commercial Road had duplicated much of the EWL route, and electrification was deemed too great a financial risk, even for the determined Metropolitan Railway. The LB&SCR along with other members of the ELRJC therefore continued to provide steam-hauled services until the line was closed during the Great War. Three classes of loco will be represented on Basilica Fields, all designed by William Stroudley, and will be explored in detail later. His A class tank No.59 Cheam stands at Shoreditch on the East London Railway, probably c1876, shortly after the Wapping – Liverpool Street extension was completed. 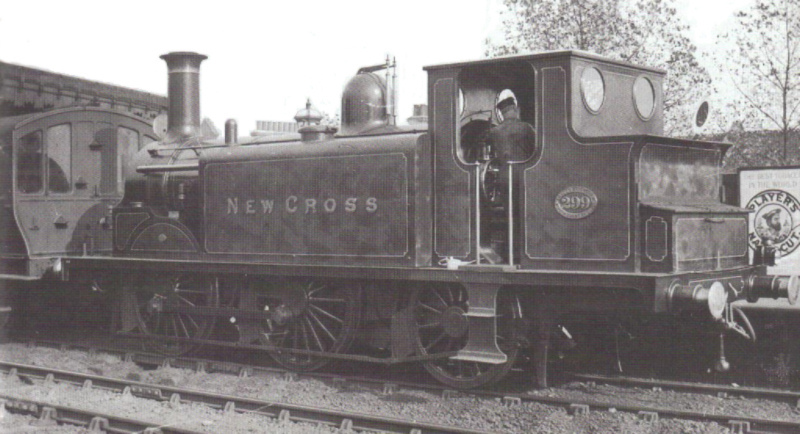 No.59 was one of only two New Cross Terriers to retain their condensing equipment beyond 1894 which enabled them to be utilised on ELR services. A further exploration of this class and its successors will follow.